Employed by us. Trained by us. Loved by you. We never use agency or temporary staff. 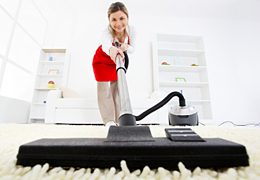 Every cleaner is employed by us, uniformed and fully trained to our own exacting standards. We think you'll love them! Your cleaners receive extra client-specific training at your place of work, so they are fully aware of your personal requirements and expectations. Continual monitoring ensures high standards are maintained throughout our contract with you. We also know that it is important for you to like and trust our staff, so our training covers people skills not just cleaning. You will be introduced to the cleaner responsible for your premises, and the same cleaner will clean each week (allowing for the usual leave such as holidays). Our policy of employing, training and monitoring our own professional people sets us apart from many our competitors, and allows you to have 100% confidence in our staff. "Executive Maintenance employ trustworthy staff who carry out their duties to a very high standard. We have no hesitation in recommending this company to others"
P J Holmes Electrical and Mechanical Services, Norwich.